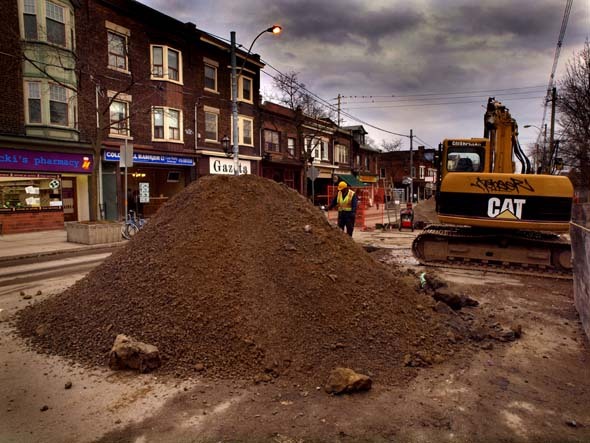 It's conventional wisdom in the city nowadays that downtown will never see another foot of subways built, and that streetcars are here to stay, and it follows that projects like the one currently finishing on St. Clair West and begun on Roncesvalles Avenue will be regular events. In case you missed it, the streetcars stopped running on the length of Roncesvalles at the end of the summer, so that the city could begin a two-phase project. The replacement of aging sewer and water mains will be completed this winter, and the replacement of streetcar tracks will commence in the spring, complete with traffic-choking "bumps" in the sidewalks at transit stops, to accommodate seamless loading of the city's new, low-floor streetcars when they come into service. In the meantime, the merchants on the street are suffering. Khalid "Karl" Bhukari has served Indian food at Shala-Mar, just across from the Revue Cinema, for 22 years now, and says that just over five months into construction "people are suffering." He's seen business crater, as street parking has disappeared along with any southbound transit, and once-flourishing Christmas party bookings have completely vanished. The city has been less than forthcoming with information, taxes have gone up this year, and the empty storefronts have already started to appear. "It costs you money to open the door," he says. "I just want to break even now - even after twenty-some years here." Businesses that were already teetering, like the Second Cup at Neepawa Avenue, were the first to go, and the eatery Boho across from Shala-Mar couldn't weather the first few months of lost trade. Cosa Pizza is gone, and the Mad Gypsy vintage clothing store just up the street is trying to sell the business on its website. Leonard McCauley is the owner of Pollock's Home Hardware, a neighbourhood stalwart for 54 years, and sits on the local BIA. He says his sales are down 30 per cent so far, with his plumbing supply business the worst hit, thanks to the loss of parking. The BIA has tried to do its best, but it was brought into the process late in the game. "The only thing the BIA has been able to parcipiate in is the planning," he says, "not so much this portion of the work, but the new sidewalks and streetcar tracks, and hopefully we'll have some say in how they do it physically. They were talking about closing the whole street. Forget about it - you might as well just shoot us all in the head." 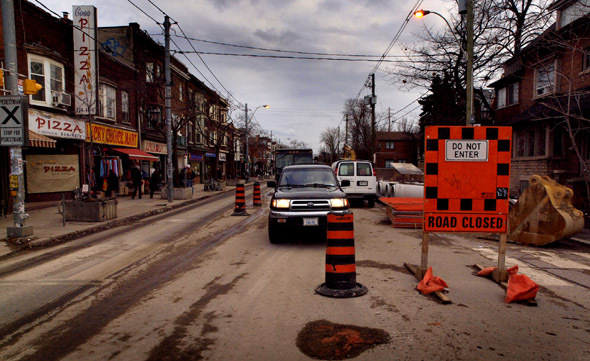 The stretch north of High Park Boulevard looks the worst these days - the street north and south of that street are being handled by two different contractors - so it's not surprising that businesses there are hardest hit. When Gary Kirk opened A Good Read over eight years ago, he gave the neighbourhood something it desperately needed - a good bookstore - but the construction has hit him harder than many. Walk-in trade is down between 70 and 80 per cent, Kirk tells me, and he's had to lay off all his staff except himself, and when the next phase begins in the new year, he says he's going to cut down his hours to just three days a week. "They've been keeping me posted in terms of construction, but I can't believe there's absolutely no parking in front of my store in December. I mean, when do they expect me to make those sales up - January? As it stands now it's been a Darwinian exercise for local business - we'll see who's left." As for Stephanie Pick, she's closing her bakery, The Queen Of Tarts, next week. She insists the construction isn't her main motivation, and says that it just felt like time to do something else, and that it was better to do it now, before the Christmas rush dissolved in the hard winter clearly ahead. She complains that the city has stopped basic services like street cleaning and clearing utility poles, and says that not even a tax break would save many businesses over the course of the two years of construction they're facing. "Even if they gave us a tax break, if your sales are down 30 per cent I don't think a tax break of $3000 is going to help you over the course of a year."